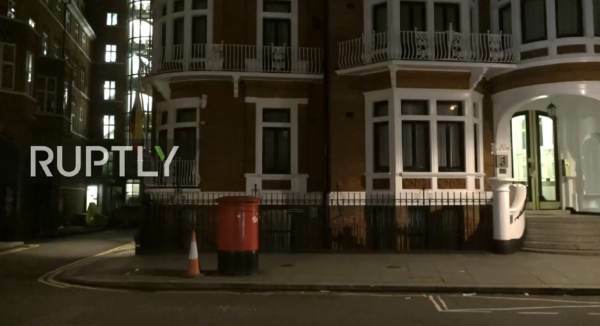 A livestream has now been set up outside the Ecuadorian Embassy in London in case WikiLeaks founder and 2019 Nobel Peace Prize nominee Julian Assange is expelled and arrested. Assange has been living in the embassy since 2012 when when he was granted asylum. On Thursday evening, WikiLeaks tweeted that a “high-level” source within the Ecuadorian state has informed the publisher that he will be expelled “within hours to days” over the INA papers offshore scandal as an excuse. Ecuadorian President Lenin Moreno is currently being investigated by their Congress for corruption, based on the INA Papers leak. “The INA Papers are a set of documents published in February 2019, allegedly uncovering the operations of INA Investment Corp, an offshore tax haven created by the brother of Ecuadorian President Lenin Moreno. The trove of emails, phone communications and expense receipts are said to link the president and his family to a series of corrupt and criminal dealings, including money laundering and offshore accounts. The leak has sparked a congressional investigation into President Moreno for corruption. Moreno can’t be summoned for a criminal probe while he remains president. He is currently being investigated and risks impeachment,” WikiLeaks reports. On March 26, the official WikiLeaks Twitter account posted about it and stated that Moreno is attempting to hand over Assange in exchange for US debt relief, which was reported by The New York Times. Assange claimed that he was being treated as a prisoner and that the Ecuadorian ambassador was acting as an agent of the US government. Ecuador is currently claiming that Assange has violated the “terms” of his asylum — though legally asylum is not meant to have “terms.” Many supporters believe that he is attempting to find an excuse to expel the 2019 Nobel Peace Prize nominee from the embassy to earn favor from the US government.